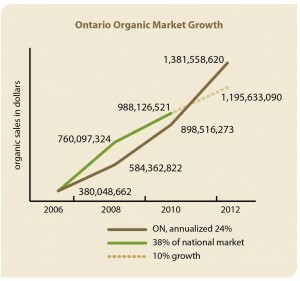 What does the Organic Council of Ontario do? This is a very important question, and I bet it’s one that more than just our staff here at Pfenning’s has asked. We thought this would be a good opportunity to talk about the work that OCO does on behalf of the entire Ontario organic sector, from farmer to consumer. AGMs can be a dry affair, particularly the formal business of organizational bylaws and Robert’s Rules of Order. However, this has been my 5th year participating with OCO’s work and I have seen the rise of some really exciting news for the organic sector, as well as heartbreaking challenges faced by the organization. The demand for organic food in Ontario is well above current supply; young people have little access to land due to inflated land prices; what are the ways that we can address this deficit? The major challenge faced by OCO as an organization is a lack of sustainable funding streams. Prior to 2012, OCO’s main source of revenue was the provincial government. Since that time, the province has shifted away from core funding of organizations to specific project-based grant funding. While OCO was being well-funded by the province it had a broad scope of activities and employed 3 full time employees. Farmer working groups, where OCO organized farmers getting together to learn from each other and figure out ways to increase organic supply and value-added products. Farm tours brought consumers to farmers to close that gap and increase interest in buying Ontario organic products. Being present at many of the food festivals throughout Ontario, as well as hosting taste fairs at retail stores, has meant success in promoting Ontario organic brand products. Partnering with the Canadian Biotechnology Action Network to help with the fight against EnviroPig (a genetically modified pig) and GM alfalfa. Was instrumental in developing the Foodland Ontario Organic brand. Promotional materials, such as pamphlets and videos, explaining the Canadian Organic Standard, directed at both farmers and businesses to increase Ontario organic product, and to consumers to increase confidence in the organic brand. Year over year since 2012, OCO’s resources have dwindled down to now barely being able to employ one staff member part-time within an office. With this level of funding OCO’s one part-time employee and board of volunteer members are not going to be able to continue with this amount of engagement with the organic sector. So the question was raised at the AGM – Does the Organic Council of Ontario have a purpose in the Ontario organic landscape? If so, with current resources, what should the organization’s focus be? OCO is the only organization in Ontario who is actively lobbying the Ontario government on behalf of the entire organic sector. This is a crucial activity, as our sector is small and easily overlooked. If we don’t have someone at the table talking to the government there will be no organic voice at the table. Jenn Pfenning, as the Chair of OCO’s Board of Director’s, sits on what is called the President’s Council. This group meets four times per year and is comprised of all the different agricultural commodity groups (OFVGA, GFO, etc. ), as well as processing, retail and consumer groups, OMAFRA staff, and often the Ontario Ministry of Agriculture. However, many of these groups do not understand the needs of their organic members and therefore have difficulty representing them. This is where OCO comes in. OCO is at this table representing the entire organic sector for the best interests of organic farms, businesses and consumers who want organic choices at markets and in retail stores. And this isn’t the only table that OCO is at. Through the relationship with Foodland Ontario, developing the Foodland Ontario Organic brand, OCO has been instrumental in promoting Ontario organics. By being present at various trade show events, OCO has conversations with everyday Canadians. OCO fields phone calls every week from farmers looking for resources on how to transition their farms. These are just a few of the examples of the work that OCO does to increase consumer confidence in the organic brand which promotes more households eating organics, while at the same time promoting more organic farms and value-added products to be grown and produced in Ontario. But here is where we hit the chicken or the egg complication – OCO can’t do all this work without any money. The fact is OCO will not continue as an organization if it does not receive core funding from the entire organic sector of Ontario. What this means is that we are all really busy and we can’t take on the world and all its ails on our own. We can do only what we can within the bubbles of our lives. While sometimes this can mean great change, other times we need to pool our resources and give those bigger tasks to a select group of people. In effect, delegate the tasks that need to be done and trust in those who are doing them. Within the small sector that is organic we are often up against a large tide. This is particularly true for the power and clout of the government, but especially true of those who lobby it. If the organic sector is not able to represent itself as a whole within these conversations, we run the risk of being shut out completely. Right now we have a very progressive Ontario government who is poised to listen to us and who is actively seeking our input through the Organic Council of Ontario. This is because of the presence we have garnered in the years leading up to this majority government. We need to band together to ensure this opportunity is not missed.